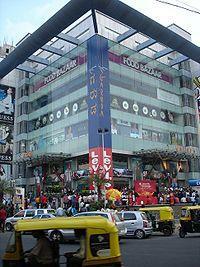 Garuda Mall is one of the best shopping mall in Bengaluru (Bangalore). The mall is located land over 75,000 sq. meters on Magrath Road, Brigade Road in Bangalore. It was started in May, 2005 by Uday Garudachar. The mall has five floors with 120 stores all type of stores. The INOX is a Cinema, situated on fourth floor with five screen and 1,150 seats. The parking facility make it very famous, the mall has large space complex for parking named Multistorey Parking lot. Thousands of vehicles can accommodate in mall parking. ATM service also available in mall you can find ATM of Citibank, HSBC and Eurochange. Garuda Mall Amoeba offers entertainment games such as kiddie rides, pinball, air hockey, car racing and the mandatory bowling. Scary House in garuda mall is like as hide and seek with ghosts and devils. There are many different rooms and you enter for 5 minute which has scary surprise for you. Mirror Maze garuda mall is very famous, actually it is a lost room whrn you enter it then you will see various mirrors and get lost. Funmax 4D Theatre offers $d quality movies and it provides first 4d sfx theatre in bangalore.